In this review, some of the current literature on the regulation of proteolysis and angiogenesis during tumor invasion is discussed. 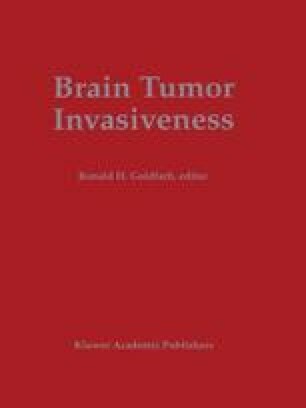 Due to the critical location of brain tumors, an understanding of tumor cell interactions with the local environment is particularly relevant. Tissue breakdown during tumor invasion is associated with proteolytic activity, mediated by tumor cells, and surrounding host cells. This review covers two classes of proteinases and inhibitors that have commonly been associated with tumor invasion i.e., plasminogen activator (PA)/plasmin and matrix metalloproteinases (MMP) with special emphasis on the MMP inhibitors, TIMP-1 and TIMP-2. At different steps of the metastatic process, tumor cells interact with endothelial cells. Tumor cells also stimulate the formation of new vessels through the expression of specific angiogenic molecules. At least eight angiogenic molecules have been purified, sequenced and cloned, four of which are discussed here. Regulation of angiogenic activity has been the focus of intense studies recently, and a wide range of synthetic and natural angiogenesis inhibitors have been discovered. Targeting of angiogenic molecules and tumor vasculature may prove useful in future cancer therapeutic strategies.